Things started off with bacon sandwiches at the Cricket Club at 10.00 with the first team of 10 riders setting off 5 minutes early at 10.25 to the cheers of a great group who had come along to wave us off. It was n’t long before the first incident of the day which involved Nick T having a burst tyre after half a mile – so a discussion is needed with Craig Woolhouse who lent Nick the bike! After help from Russ Balmforth, Kev Girdlestone and Jenny, Nick was back on the road but not without a delay of 25 mins! This meant Nick and Kev were playing catch up until we got to Almondbury but it was a real pleasure to spend the first hour and a half having a good work out to catch up with a great guy like Kev. It was a tough ride – we spent some of it speeding down hills but the majority of it working hard getting up the hills in the first place. So not only was it 44 miles but it was a hard 44 miles. Every rider should be really pleased with themselves, especially the younger riders – Indya Sheeney, Riona Lang, Naimh O’Dea, Ben Balmforth, William Bullingham, Alistair, George Oakley and Carys. Also some of the riders completed it without any training – Sam Briggs, George Oakely, Cam France and Steve Hobson (and there were probably others) – due to cricket and other commitments. That is a testament to their fitness and determination, although at times they may have wished they had put in some miles on the road beforehand! I’m not sure of the names of the 2 oldest riders but at least 2 were well over 50 – that means there was over 40 years covering the oldest and youngest; that made it a real community event – a community that Huw was so much part of and that he valued so much. Highlights for Nick, Jenny and Carys were visiting Honley and Scholes cricket grounds where we had seen Huw hit sixes into the back gardens of neighbouring houses last season – and also Meltham which was next to the football ground where he scored 2 goals in 10 minutes in 2010 – one direct from a corner and the other a towering shot from over 40 yards! Of the 15 cricket grounds visited, Huw had played at 9 of them over the years. It was a pleasure to spend some time with friends, meet some new people and turn some acquantances into friendships. We were also glad to see the local MP Jason McCartney who joined us for part of the ride and offered to get a bottle of House of Commons Whisky signed by the Prime Minister for a future raffle for the Trust. And all of us are indebted to Joy for organising the day – she did such a good job. It was such an inventive idea and she spent hours preparing for it – thank you to the Oakleys for a great experience. Joy had a smile and words of encouragement for everyone – and had even arranged sponsorship for the event. I know Joy got a lot out of the day – and so she should – just a great effort from a lovely family. We also want to thank all the participants, their sponsors, the support drivers, Taylor’s food store for the bananas, Sainsbury’s for the snacks, Henry’s wine bar in Skelmanthorpe, Cobwood Trophies for the awards and medals, Joy’s brother in law for the water, Sooty and Sue at the Cricket Club bar, Rob for the great chilli afterwards and everyone at all 15 cricket clubs who donated so generously and made us so welcome. 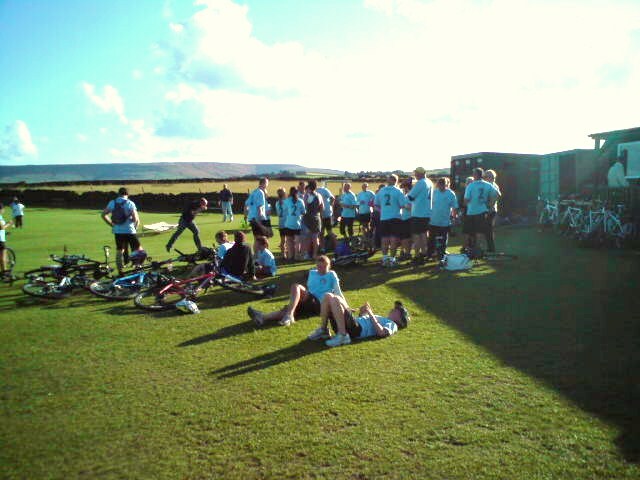 It was also lovely to be cheered on at each cricket ground and by people on the roadside in and around Holmfirth. It was a day full of friendship and support which was typical of Huw, and the ride was just the right thing to do; doing something positive, with friends, remembering Huw and raising money for brain injured people. Another day in a long list of days to remember one of the most popular members of Upperthong Junior Cricket Club.